Manila, Philippines - Weather bureau PAGASA released ninth severe weather bulletin for 'Bagyong Glenda' with international name of Rammasun. 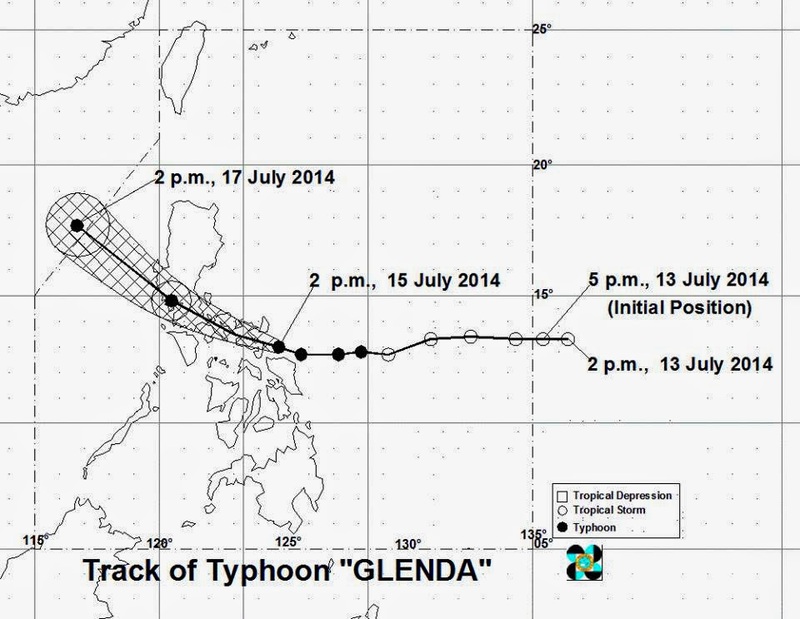 Issued at 5:00 PM on Tuesday, July 15, 2014, PAGASA said that typhoon 'Glenda' is now over the Albay Gulf as it approaches Legazpi City. At 4:00 PM today, the eye of Typhoon “GLENDA” was located based on all available data at 60 km East of Legazpi City, Albay (13.1°N, 124.3°E). It has a maximum sustained winds of 130 kph near the center and gustiness of up to 160 kph. It is forecast to move West Northwest at 19 kph. Typhoon “GLENDA” is expected to make landfall over Albay this evening then cross the Bicol Region towards Southern Luzon. It is expected to pass Metro Manila before noon tomorrow (July 16) and in the vicinity of Bataan in the afternoon and will move towards the West Philippine Sea. By Thursday afternoon, it will be at 370 km West of Sinait, Ilocos Sur outside the Philippine Area of Responsibility. Catanduanes, Albay, Sorsogon, Camarines Norte, Camarines Sur, Masbate, Quezon including Polillo Islands, Marinduque, Laguna, Batangas, Rizal, Northern Samar, Northern part of Samar, and Northern part of Eastern Samar. Southern Aurora, Cavite, Bulacan, Pampanga, Bataan, Nueva Ecija, Pangasinan, Tarlac, Zambales, Lubang Island, Oriental Mindoro, Romblon, Biliran, rest of Samar, rest of Eastern Samar, Northern part of Leyte province, and Metro Manila. Northern Aurora, Quirino, Nueva Vizcaya, Benguet, La Union, Occidental Mindoro, rest of Leyte, Southern Leyte, and Northern Cebu including Cebu City Camotes Islands. PAGASA advised residents in low-lying and mountainous areas under signal no. 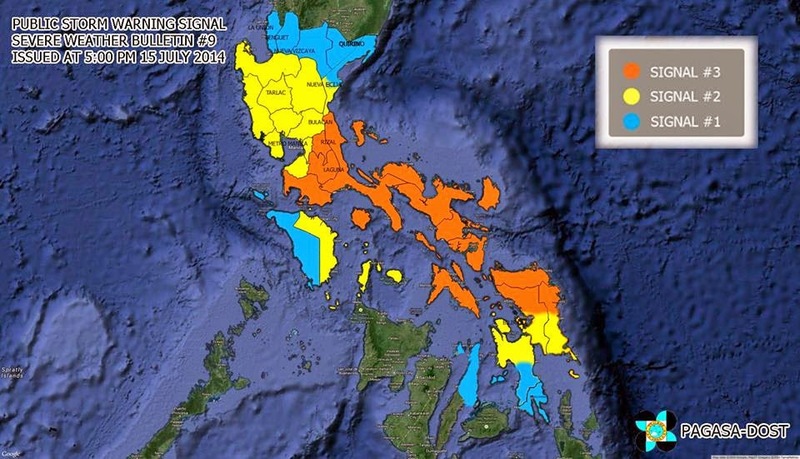 3, 2, & 1 to be alerted against possible flashfloods and landslides. Likewise, those living in coastal areas under signal no. 3 and no. 2 are alerted against storm surges of up to 3 meters. The estimated rainfall amount is from 7.5 - 20.0 mm per hour (moderate to intense) within the 500 km diameter of the typhoon. Fishing boats and other small seacrafts are advised not to venture out into the Eastern seaboards of Luzon and Visayas. The public and the Disaster Risk Reduction and Management Council (DRRMC) concerned are advised to take appropriate actions and watch for the next bulletin.